Ireland will become the eleventh Test Nation when they play Pakistan on Friday the 11th of May and Merrion's Tyrone Kane and Ed Joyce are part of the fourteen man squad for the game. The Joyce’s are one of the great Merrion families, producing five International cricketers. Ed, Gus, Dom, Isobel and Cecelia have all been capped for their country. Ed, one of the finest batsman Ireland has ever produced, will join younger sister Isobel as a "test cricketer". Izzy made her Test debut in Ireland's win over Pakistan in 2000. Perhaps the most incredible "Joyce" moment occurred when Ed made his England debut against his younger brother Dom in 2006. Tyrone starred for Merrion and Leinster from an early age and was a crucial member of Ireland 2012 Under 19 World Cup squad in Darwin. He has won a Leinster Senior Cup and an All-Ireland with Merrion. His call-up to the squad may have been a surprise to a few but excellent early season form for club and province was enough for Head Coach Graham Ford to pick him after a three-year national team exile. 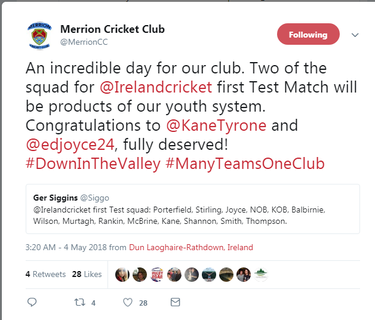 It is an incredible achievement for Merrion to have two products of our youth system involved in such a momentous day. Ormond finished by saying "we hope that their achievements will encourage other Merrion players to strive to emulate them". Ireland take on Pakistan in Malahide on Friday starting at 11am.